Timely Comics Values: What Are Your Golden Age Timelys Worth? Timely Comics was an imprint of Timely Publications. It was a Golden Age subdivision of Martin Goodman publishing. 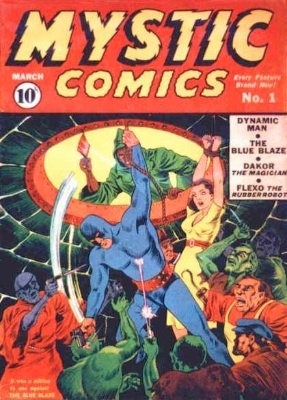 Goodman was a 'pulp' publisher, and in 1939, the decision was made to start a division to produce comics, after the success of Superman for Detective Comics the previous year. Martin Goodman was the editor in chief, and his brother, Abraham Goodman was listed as publisher. A young gent by the name of Stanley Lieber, later known as Stan Lee, who happened to be a cousin of Martin Goodman's by marriage, had started with Timely as an assistant in 1939. When Joe Simon left Timely to join DC Comics, Lee was promoted to interim editor of the entire comics line in 1942, at the tender age of 19. He would hold that position for decades, becoming publisher of the by-then renamed Marvel Comics. Have your Timely Comics valued. Send us details of your collection, and we'll appraise them free! The first title published by Timely was Marvel Comics #1 in October of 1939, and which proved so popular that it required a second printing and eventually sold more than 800,000 copies. 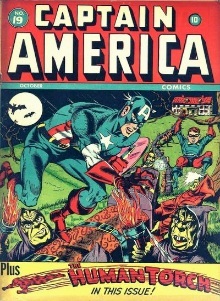 By issue #2, it had been renamed Marvel Mystery Comics (click for full article), and in 1949 would become Marvel Tales. The work of Bill Everett, Joe Simon and Jack Kirby, Carl Burgos, Stan Lee, and a number of other comics legends would appear in its pages over the years. 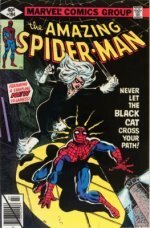 From the start, Marvel Comics/Marvel Mystery Comics was a superhero-dominated anthology comic. 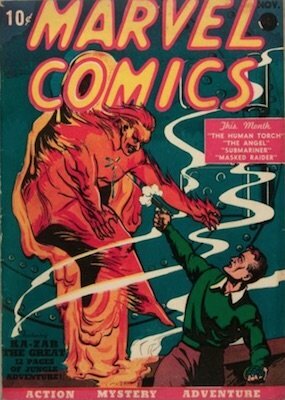 Issue one featured the Human Torch, the Sub-Mariner, Ka-Zar, Lord of the Jungle, and several other features less notable. 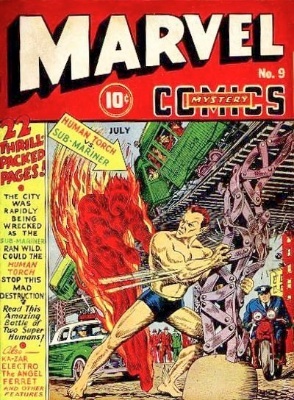 The Torch and Sub-Mariner would continue to feature in Marvel Mystery Comics until the 1949 shift to Marvel Tales, along with many heroes who did not make enough of an impression to survive into the present. Very few remember American Ace; even fewer would remember The Ferret. Either way, Marvel Comics set things into motion in 1939 that are still in motion today. Even after the Torch and the Sub-Mariner got their own titles, they both still graced the pages of Marvel Mystery Comics every month. After making a big splash with his first appearance in Marvel Comics #1, and then appearing regularly in the renamed Marvel Mystery Comics, the Golden Age Human Torch (an android who used the name Jim Hammond) got his own title in the fall of 1940. 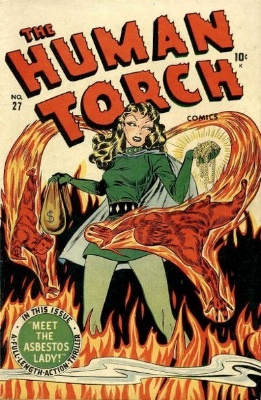 Created by Carl Burgos, the Human Torch and his teenage sidekick, Toro, would remain a mainstay in Timely Comics' line for 35 issues, eventually being cancelled in 1949. 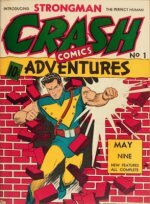 The character would continue to appear in other anthology comics like Young Men and Men's Adventures, and even a brief two-issue revival in the 1950s under the Atlas Comics imprint, but he wouldn't be seen again until a 1966, Silver Age battle with a much-younger hero who bore the same name and powers in The Fantastic Four Annual #4. Eventually, the original Torch would figure into a classic Silver Age series which connected him with another android character, the Avenger known as the Vision, in Avengers #57. 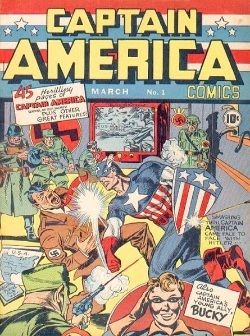 Captain America Comics #1 appeared in March of 1941, and was an instant hit for Timely. Conceived and written by Joe Simon, and penciled by later Marvel mainstay Jack Kirby, Captain America and his teenage sidekick, Bucky Barnes, became the first patriotically themed superhero to succeed and last. 98-pound-weakling Steve Rogers was too frail for military service, but his desire to serve his country inspired scientists to give him an experimental serum that turned him into a "Super-Soldier", and once costumed in red, white, and blue, Captain America would become Timely Comics' most successful creation. 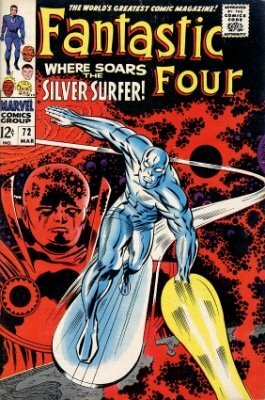 Stan Lee wrote a short backing feature for issue #3, and eventually became writer and editor when Simon and Kirby left for DC after ten issues, with Syd Shores and Al Avison handling the art duties. Captain America Comics would run, like the Human Torch, until 1959. Unlike the Torch, when he was revived for the Silver Age, he was literally "revived", rather than rebooted, like the Torch. Mystic Comics was a short-lived anthology series that had an odd, stop-and-start history. It had two separate runs, one from 1940-1942, and one from 1944-1945. The series is significant because it spawned Stan Lee's most popular superhero creation before the Fantastic Four: the Destroyer. The Destroyer was Keen Marlow, captured by Nazis while spying behind enemy lines. Interred in a POW camp, he was given a super-soldier serum like that given to Captain America by an imprisoned scientist. With his resulting super-strength, he escaped the camp and fought Nazi Germany from within. Aside from the 'Big Three', (Captain America, Human Torch, and Sub-Mariner), the Destroyer was the most-published super-powered hero in Timely’s roster, and he appeared in every Timely publication that showcased superheroes at least once. Namor, the mutant son of a human sea captain and a princess of the race of mermen and mermaids of the undersea kingdom of Atlantis, had super-strength, the ability to breathe underwater, and wings on his ankles that enabled limited flight when out of the water. Created by Bill Everett, the Sub-Mariner had begun his Timely adventures in Marvel Comics #1, along with the Torch. 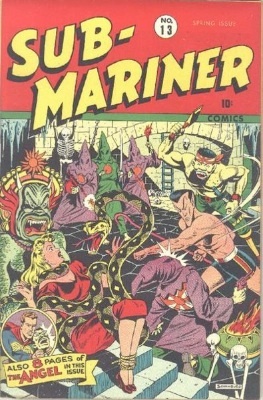 He would continue to appear regularly in that title, even after he gained his own, Sub-Mariner Comics, in the Fall of 1941. Usually drawn by Bill Everett, Namor's adventures were among the most popular of the Timely Comics characters, and after a few false-start revivals in the 1950s, he was revived, but not rebooted, in the same way that Captain America had been. This list is courtesy of Wikipedia. We have added the first appearance issues beneath the names of each character, and links to comic book values where we know them. Timely Comics' time would ultimately be even shorter than the Golden Age, becoming Atlas Comics by 1951, and making the switch to adventure, horror, mystery and Westerns like most other comic publishers. The company would adopt the name Marvel Comics in 1961, taking its name from the first Timely Comics publication, Marvel Comics #1, which had gone through the names Marvel Mystery Comics and Marvel Tales by that time. Through all these changes, however, the company would remain devoted to comics. Timely responded to the trend away from superheroes with westerns and mysteries, like every other comics company. But they also changed their name, to Atlas Comics. Stan Lee remained as editor in chief, and when eventually the resurgence of superheroes that we call the Silver Age began, in the late 1950s, Atlas would become Marvel, named after the very first title that Timely had ever published, and the rest, as they say, is history. Contact us for a free valuation of your comic books. We'll appraise them for insurance, or offer you a Dollar value if you wish to sell. 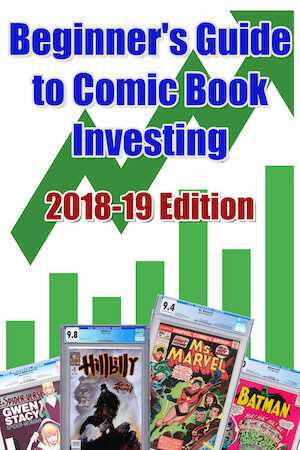 Learn the value of Marvel Comics #1 and the other Marvel Mystery titles which eventually led to Marvel's current market position. Learn the value of the Captain's Timely appearances, from the 1940s until the end of the Golden Age. Learn the value of all the old Timely and Marvel Comics, from the late 1930s all the way into the Bronze age and beyond.